Rabbi Reuven Spolter, head of TZOHAR's overseas operations, explains the importance of reaching out to English speakers. The TZOHAR Rabbinical Organization on Wednesday held its annual summer conference, which included a dedicated track for English speakers this year. The conference, at the Jerusalem Convention Center (Binyanei Hauma), included a day-long series of sessions and panels on a variety of contemporary issues relevant to Israel and Judaism. The English track, which was designed by TZOHAR’s Rabbi Reuven Spolter, specifically tackled the questions of whether an Anglo can ever truly fit in within Israeli society and if they have any influence in the Diaspora Jewish community. 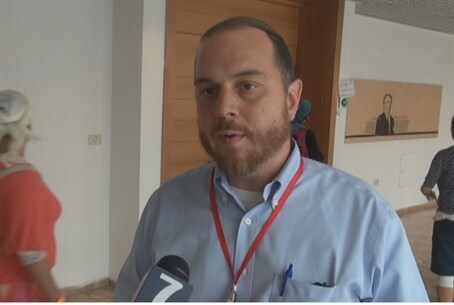 Speaking to Arutz Sheva, Rabbi Spolter who serves as TZOHAR’s overseas rabbinic coordinator, explained how the organization reaches out to English speakers and to Jews overseas. “If TZOHAR is going to be a rabbinic organization, it’s important that it becomes an international organization and that there’s a sense of ownership about what goes on in Israel and around the world as well,” added Rabbi Spolter, who said that it is important not only for people around the world to be aware of Tzohar’s activities but also for them to be involved.